Welcome to high school. Forget about getting any sleep or a decent lunch for the next four years. Brace yourself for too much homework, too much attention from dangerous seniors, and no idea at all what your Spanish teacher is talking about. Or your math teacher, for that matter. 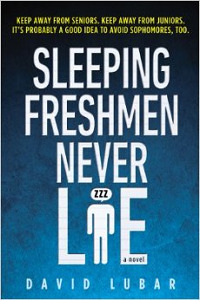 Join freshman Scott Hudson for a very funny look at a serious time of life. Click here for a taste of the amazing Full Cast Audio recording. Production Copyright 2006 by Full Cast Audio.